Mention to friends that you’re going to Mardi Gras and their immediate assumption is that you’re going to New Orleans. This happened to me dozens of times before I went to Louisiana last February. The conversation went something like this. The fact is, Mardi Gras, a.k.a. “Fat Tuesday,” is celebrated in several states throughout the southeastern United States and each of these festivals has its own claim to fame. The friendly lakeside town of Lake Charles, population 72,000, boasts that their Mardi Gras is the second largest after the Big Easy extravaganza. Other towns might dicker over this claim, but I’m not too fussed because the Lake Charles festivities sure seemed big to me — and a lot of fun! No drunks staggering about throwing up on the sidewalk. No overzealous cops harassing revelers. No obnoxious frat boys asking girls to get their clothes off. None of the above! The Lake Charles Mardi Gras has a reputation for being a family-friendly event where you can take the kids without worrying about overexcited people under the influence of whatever — so you can just get on with enjoying the event. What exactly is Mardi Gras, anyway? Based on the day before Ash Wednesday, this quasi-religious event signals the start of the Lenten season. 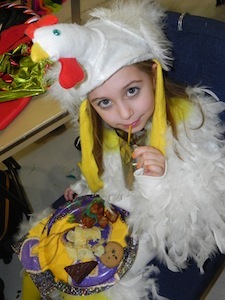 But Mardi Gras — Louisiana style — morphed long ago into a multi-day event that celebrates the season, rather than one day. Dredged from the recesses of Louisiana’s fascinating milieu of French/Cajun/Catholic history, Mardi Gras is a good excuse to throw a really big five-day party. And it means different things to different people. For some, it’s an excuse to dress in outrageous, colorful, and glitzy costumes — many of which defy description — and parade around at a Ball or Gala, soaking up the spotlight in front of thousands of enraptured spectators. 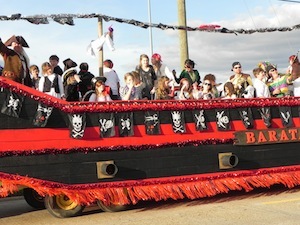 To others, it means being on a parade float resembling a pirate ship or a huge alligator, and for foodies it’s an excuse to overindulge in Cajun and Creole cooking — gumbo, jambalaya, étouffée, and catfish, to name a few. At the heart of this energetic bash are the krewes, the cohesive glue that binds all Mardi Gras events together. The term is based on Cajun French for “crew,” and Lake Charles boasts about 60 of them. They’re civic groups of friends, families, neighbors, and work associates who, every year, select a theme for their krewe and work all year preparing their costumes, floats, and shows, many of which feature devilishly clever assemblages of finery. Then they don these outfits like giant peacocks and strut their stuff over the Mardi Gras season. The krewes go by pseudo-French names like Krewe de Autre Chance, Krewe des Bon Amis, Krewe de Carnivale, Krewe of Chaos, Krewe of Illusions, Krewe des Lunatiques, Krewe des Pirates — you get the idea. Some families have been in krewes for several generations. Such is the otherworldly mystique associated with the krewes that they have almost taken on a deeper meaning than can be explained in a two-minute elevator talk to a stranger. Perhaps the best way to plumb the depths of this meaning is to attend a Gala or Ball, where the whole concept seeps into your psyche bit by bit, as the krewes parade up the central aisle, each trying to outdo the others with their mind-blowing costumes. The krewes elect a King and a Queen (with titles like Duke & Duchess of Splendor and Opulence, or Duke & Duchess of Mysticism and Passion) who wear over-the-top regalia resplendent with multi-colored feathers, glittering sequins, lengthy gown trains, and towering back pieces, all of which weigh 40 or 50 pounds and can cost hundreds or even thousands of dollars. 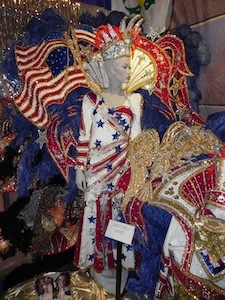 There’s a museum where you can view dozens of these costumes, but more about that later. Here’s how you can enjoy the full and complete Mardi Gras experience in Lake Charles. If you’re with a group, hiring a bus or van is a must. It makes the whole experience much more enjoyable if you’re partying together, rather than driving in a long line of cars (and parking is sooo much easier). Ralph Huval’s appropriately named Bon Temps Express bus was our transport, with plush leather chairs arranged around the sides, a bar, and a dancing pole in the back (seriously!). Getting dressed up in gaudy beads, masks, and hats (and whatever else takes your fancy) is an integral part of the Mardi Gras experience. Visit The Party Time Store to stock up on your MG paraphernalia. It’s a fun place to browse for trinkets classy and tacky, and both are essential for a Maximum Mardi Gras. Now that you have your Mardi Gras beads and masks, the Krewe of Illusions Presentation and Ball, held in the Lake Charles Civic Theater, is a perfect way to get your Mardi Gras game on. 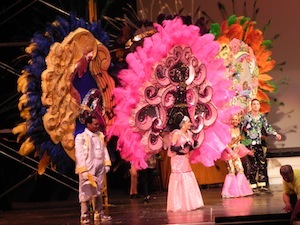 This lavish two-hour show (tuxedos and full length gowns only) features a series of song and dance acts, with most performers wearing the ubiquitous Mardi Gras costumes. But this cross between a costume party, a sing-along, a rock show, and an MTV takeoff is only the first half of your evening. Immediately following — in a huge ballroom next door — is the largest BYO and potluck you’ll ever see. Food, drink, party favors, and elaborate Mardi Gras decorations are crammed onto the ballroom’s round tables. People hop from table to table socializing and dance to the onstage band. Fun bash! The Children’s Parade also gives a taste of things to come and gets you in the Mardi Gras spirit. 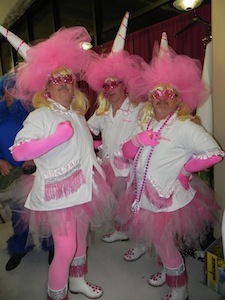 Here you’ll see many of the krewes and their floats in a dress rehearsal for the BIG parade on Fat Tuesday. And, if you’re fleet of hand and eye, you’ll score dozens of strings of trinkets, beads, necklaces, candy, and doubloons from the “float people.” Make eye contact with a bead thrower, yell the standard Mardi Gras call (“Hey mister, throw me something!”), and you’ll be bombarded by dozens of colorful bead necklaces flying through the air. nbow-colored cloth, silk, feathers, and sequins, in costumes large and small, with decorations and themes that simply defy the imagination. Dragon’s heads. American flag suits. African voodoo suits. Imperial Roman garb. And more. For a healthy dose of rural Louisiana, visit the annual Mardi Gras Run in the small town of Iowa. This is no slick big city parade, nor does it pretend to be; rather, it’s a series of floats mounted to pickup trucks or semis that trundles through the town along Highway 90. The decorations are often taped together with duct tape and the floats are filled with locals enjoying their neighborhood. This parade may sound modest, but you’ll have more fun than you imagine participating in the festivities. Where else can you see dozens of excited kids (and a not inconsiderable number of adults) chasing terrified chickens under houses and across porches and fields? After the event, enjoy the gumbo made with food donations given by people along the parade route: everything from smoked sausages to chicken, shrimp, crab, okra, rice, and seasonings, cooked in enormous army-sized pots on the local KC Hall stove. The social culmination of Mardi Gras, the Royal Gala is held on the evening of Lundi Gras (the Monday before Mardi Gras) in the Lake Charles Civic Theater. This is the only event in Louisiana where the public is allowed to see the Lake Charles Royal Courts in full costume before the Mardi Gras parade. Make special arrangements in advance to walk around backstage so you can admire the dazzling costumes as the krewes prepare for their limelight promenade down the center of the adjacent stadium. The bright, cavernous room buzzes with excitement for this dress rehearsal as the participants run around borrowing tape and pins from each other to assemble their costumes, and pose ridiculously for each other. You’ll be awed by the color and creativity. Inside the stadium, spectators sit in the bleachers high above the parade or rent aisle tables right next to the central promenade. Most people bring their own food and drinks and kids can sit right on the sidelines to watch the show, their eyes wide open in amazement at the spectacular costumes. It pays to assemble on the parade route a couple of hours before the grand parade, to ensure an uninhibited view and maximum bead catching. It gets crowded quickly, with residents holding lively block parties along the course. Then, as darkness falls, the 60 krewes emerge along the parade route in a cacophony of music, gaudy costumes, and bead throwing. If you’re not catching scores of bead necklaces, you’re not trying hard enough. And this seems like an appropriate time to end this story with the official Mardi Gras Battle Cry, Laissez les bons temps rouler! Harlequin Steaks and Seafood — This well-known restaurant boasts a combination of southern food (chicken and sausage gumbo, crawfish pasta, crawfish étouffée) and a variety of steaks. The Mrs. Hunters’s Bread Pudding is divine. 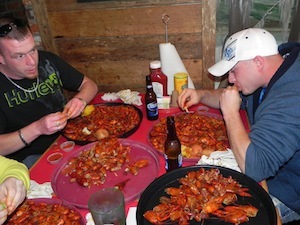 Steamboat Bill’s — This place absolutely buzzes with a friendly clientele and serves a traditional Cajun and Creole menu including enormous platters of boiled crawfish, shrimp pistolettes, gumbo, étouffée, po-boys, and much more. Ask one of the waiters to show you the resident alligator in the swamp out back, beside the parking lot. Le Beaucoup Buffet, L’auberge Casino Resort — This is the largest and best-prepared buffet I have had the pleasure of dining at. The choice of meats and foods is fantastic! Mardi Gras Gumbo Cook-Off — You get to sample pots of chicken, sausage, and wild game gumbo in this contest held in the Lake Charles Civic Center Exhibition Hall. You’ll meet the locals and taste some superbly-crafted gumbos for a small entry fee. No shortage of rooms here — more than 1,000, in fact. The selection of restaurants is excellent and the staff friendly and welcoming, more so than you’d expect from a place this size.